Through 15 years, Mooseheart’s annual Blessing of the Bikes has grown, expanded and become a fixture on the campus’ calendar. This year’s event, which took place May 19, was again a success, attracting 200 motorcycle enthusiasts on 155 bikes. Those Moose motorcyclists, known as Moose Riders, brought checks totaling $15,264 to deliver to Moose Charities in support of Moose Fraternity efforts. Then they embarked on a tour of the Mooseheart campus, which ended at the campus’ House of God, where they received a blessing for a safe riding season. First, however, Moose Riders got to become spectators as, for the first time, Mooseheart’s students participated by riding their bicycles from the campus’ school building to the House of God. At the end of their ride, they pedaled between curbsides lined by applauding Moose Riders. 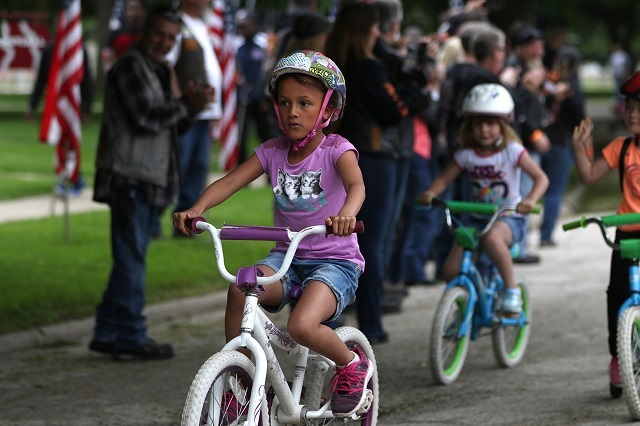 “Having the kids ride their bicycles and parade through the Moose Riders – that was a hit. There was meaning behind those claps. Maybe it was only 150-200 people, but it had the magnitude of a stadium full of people cheering. It’s a moment where you sit back and appreciate the amount of work everyone does to make this happen,” Mooseheart Executive Director Gary Urwiler said. Bike blessings are annual events where riders receive a blessing and wishes of a safe riding season. Moose Riders raise considerable money for Moose Charities through their fundraising efforts. Mooseheart freshman Gabriel Munoz delivered this year’s blessing and Mooseheart coordinator of campus ministries Casey Beckley added an additional blessing for a safe riding season. “It was nice to see the amount of money the event was able to raise. The efforts and the money provided by Moose Riders through their service is really beneficial We had people ride in from Wyoming, Pennsylvania and Texas, and those aren’t rides you do in a day or two or in a few hours or just in good weather. It speaks to the hearts of these motorcycle enthusiasts that they do this. They truly care for people,” Urwiler said.